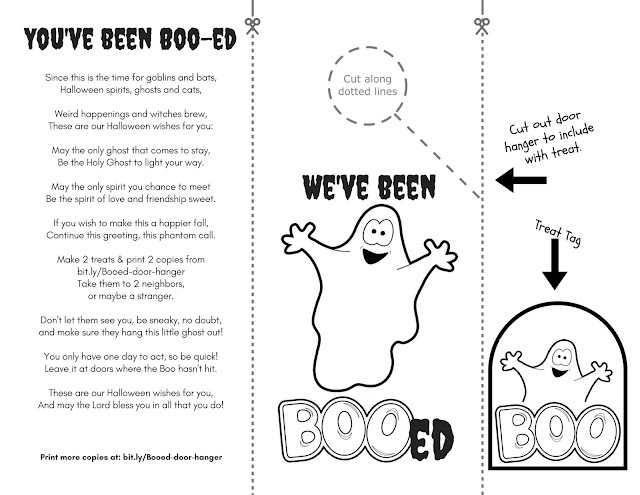 Yes...it's yet another Halloween Boo-ed Printable! But this one might be a little more Biblical. Hahaha...I love rhymes, thats the end of that one for realz, they are my fave! After seeing several "Halloween Boo-ed" rhymes & printables, I really liked this poem which had a little LDS twist to it. If you look, you can always find Christ in everything! We can remember Christ even in the Halloween Season and this sister really helped me see that! Is the Holy Ghost to light your way. Then theres the standard Boo-ed Poem from BeenBooed. So, I took the first and added to it from the 2nd and made it a little our own because now it's something I can support (not that I couldn't before but as one of the YW in our ward would tell her mom about me just before we went for pedis, "Sis. Winegar always talks about Church.") and then I changed it to a door hanger because...why not? Isn't it soooooo cute?! Poems from The McIllice Spot blog & BeenBooed and edited & combined by me! 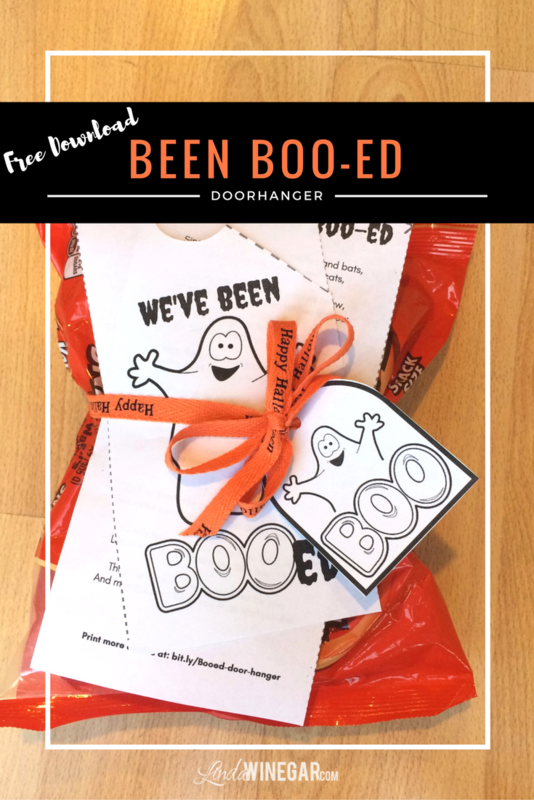 Free Halloween Graphics from Homemade-Preschool. What kind of treats do you give? Honestly, I used to make cookies, cupcakes or other fancy goodies and decided that I no longer should do that for 3 reasons. Would you eat cookies from a stranger? I mean would you eat them if you weren't...me? I'd eat treats that fell on the ground if they had chocolate. Yes...I know I have chocolate probs! One of my friends told me she'd just throw treats away if they didn't have a name on it. I was shocked to say the least. She could have gave them to me, I'd eat them! But I can totally understand, getting sick isn't worth any amount of chocolate. Seems like everyone is on a diet of some sort and I don't want to be the culprit who made them weak in their resolve. And then there are some kids are on parent bets like "no sugar or candy" for a year so they can get $100. Yeah...and kids do it! Mine would last a day or 2 and then just realize they could think of business ideas to earn their $100+, just so they could eat sugar and buy whatever they want. I have smart & sneaky kids! Honestly, it's like Halloween month and everyone and their room-moms need candy for school lunches, class parties, church trunk-or-treats and of course on Halloween Day! So give your peeps something they can share, if they want to. Call it what you want, but for me giving a bag full of chocolate candy it's NOT called lazy, or copping out, it's called being intentional and thoughtful! I can save the cute treats for Hubby's work, pot lucks, cub scouts, or even dinner parties. Download Been Boo-ed Sign JPG! 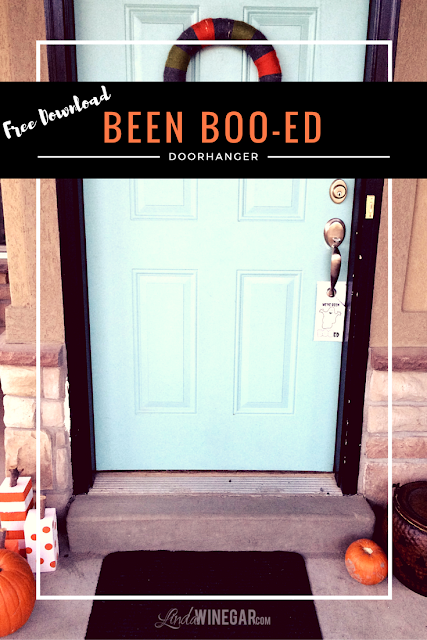 Download Been Boo-ed Sign PDF! Disclaimer: I didn't like seeing my name on the actual BOO-ed sign. Everyone would think I dropped them off LOL and my neighbors would immediately know it was me, I made it a bit.ly link directly to the google file so that it would remain somewhat of a secret for me. Also... it's really hard creating a link for a document that doesn't exist yet because as you can see it's part of the poem. So...If your friends somehow, find out it was from me...I'm so sorry and that's the best I could do. But feel free to link to this page for the download to give credit where credit is do, since I'm not the only person who contributed to this boo. Hey, that rhymed! And if you're not sure how the door hanger works, here's a pic of that. WOW! Can you see that? I can't even believe I'm posting it, My door is so dirty and no amount of filters could get rid of that. Oh well...guess we need a Fall cleaning, but that's going to have to wait until maybe Spring. 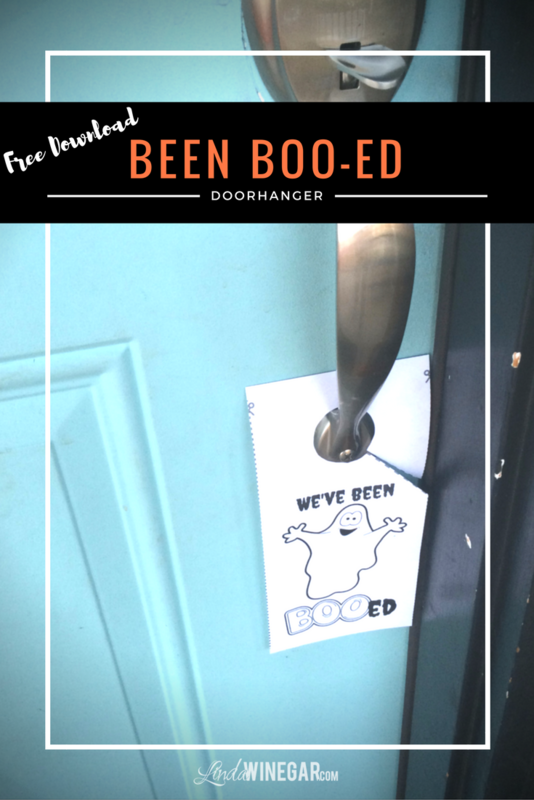 LOL But you get the idea with the door hanger...it's cute!